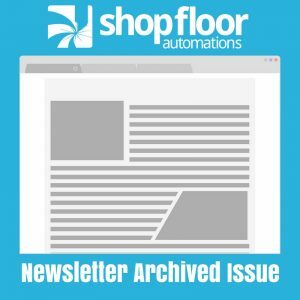 The following is a January 2011 Shop Floor Automations newsletter archive. As we move forward in 2011, we are excited about the rebound in the manufacturing industry. Business is improving and the economy is getting stronger. We have a few new products that will help to keep American manufacturing companies organized and competitive. Collect data real-time data from the shop floor on every piece of equipment including CNC machines network-based, RS232, wireless or existing PLC interfaces. Instantly capture cycle, idle, alarm, setup and more. Even better view the data across the web or on your Smart Phone. The USB Connect device acts as an interface between commercially available USB flash memory and any CNC control with an available RS232 port. Machine tool files can be sent from CNC memory to the USB key, USB key to CNC memory or drip-fed (DNC) from the USB key. Flexible DNC firmware is built into the USB Connect unit allowing connection to just about any machine tool CNC control. The USB Connect is also available as a pendant or portable model and supports the Mazak CMT format. Shop Floor Automations (SFA) is committed to providing its customers individualized solutions for their manufacturing automation needs. By offering an extensive collection of shop floor software and hardware products, SFA can scale its automation solutions to customers of any size, regardless of needs. Give us a call to learn how we can help you today! To keep manufacturing going, we have established new lower service rates. If you need cabling, hardware installation, troubleshooting of legacy systems or upgrades to Predator Software, give us a call. We want to do what we can to keep the industry strong and keep the machines running. Because Shop Floor Automations is passionate about bringing your legacy machines up to date, we also realize that social media is a growing and helpful tool in the manufacturing industry. We would love to connect and be added by you on our Shop Floor Automations social media channels!